The row started after Norwegian Prime Minister Erna Solberg proposed an “under the line” budget item to cover the estimated 19 billion kroner ($2.2 billion) it will cost to replace a navy frigate that collided with a tanker and ran aground last year and to resurrect the government offices destroyed in Anders Behring Breivik’s 2011 terror attack. Solberg, trying to create room for tax cuts and other budget priorities in the years ahead, argues that these unanticipated costs shouldn’t be counted in the regular budget. Re-elected in 2017, the 57-year-old has spent her time in office fending off an oil crash that began in 2014, spending record amounts and making the first-ever withdrawals from the nation’s $1 trillion wealth fund. Excluding its giant piggy bank, Norway’s budget deficits amount to more than 7 per cent of gross domestic product. Her scolds, including economists, the opposition and current and former chiefs of the central bank, say that she’s heading down a slippery slope that risks the fiscal framework that has kept politicians in line over the past two decades and helped Norway build the world’s biggest wealth fund. “This is a way to circumvent the fiscal spending rule,” said Svein Roald Hansen, a lawmaker from the Labor Party and member of the legislature’s Finance Committee. 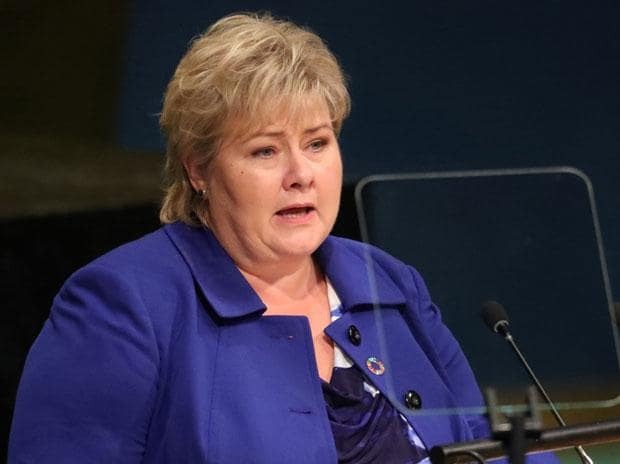 The dispute has been characterized in the local press as a way for Solberg to sneak in the use of more oil money, beyond the roughly 230 billion kroner she now takes to pad deficits. The fiscal rule states that the government can use up to 3 per cent of the wealth fund’s value to fill budget needs, a limit she has stayed below so far. Her government even tightened it from 4 per cent in 2017. But should she prevail, the financing could come from the bond market. Norway, which has no real need to issue debt, nonetheless keeps a bond market alive to fund housing loan programs and other social needs. These are also so-called “under the line” items. And while increased supply is typically bad for bonds, in Norway’s case it might actually be welcome. The country’s AAA rated debt is in high demand and there’s just about 400 billion kroner outstanding. In its latest bond issuance, a sale of 2 billion kroner of two-year notes this month, Norway got 9.5 billion kroner in bids. “That would also be a way of making clear that it’s not a use of oil money, but the interest payments would be part of the ongoing expenses,” said Kyrre Aamdal, senior economist at DNB ASA, Norway’s biggest lender. The other route for Solberg would mean snatching the cash straight from Norway’s oil income. That could be troublesome for an economy now firing at close to full capacity. Solberg has pledged to keep a fiscally neutral stance and avoid a too strong currency. Aamdal said the amount in question isn’t so big that it couldn’t be covered in the normal budget process, but it could mean tightening up elsewhere or it will have an expansionary effect on the economy. “In other countries that don’t have the same kind of funds available as us it would probably be financed by increased borrowing,” he said. Tapping the bond market “could draw some liquidity from the private sector, making the expansionary effect slightly less than if the funds were drawn directly from the wealth fund,” he said. A spokeswoman at the Finance Ministry said that the proposal first needs to be evaluated and that it would be “hypothetical” to give any details on how it could be implemented.